I am so pleased to share this wonderful collage sent to me by Genevieve. How cool is this? Thanks to Stéphanie in Belgium, for sending me this great photograph of her Kipster, which she is using for crochet projects. 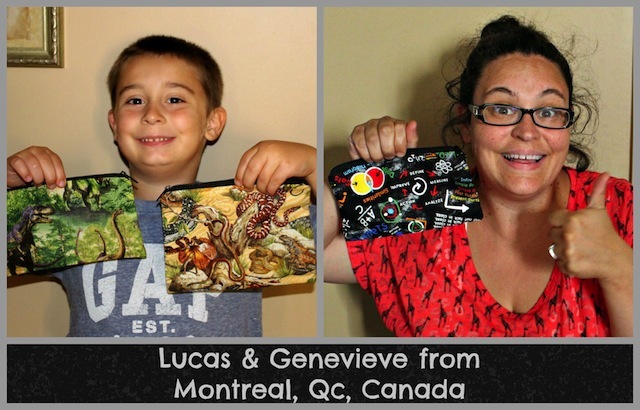 I received a custom order request last year, for 7 coin purses, each made with a different bowling themed fabric. I am so pleased to share this wonderful photograph with you, of the recipients of those coin purses, taken in the bowling alley! Many thanks to Susan for sharing this with us. Honestly, I've never had a bag that I like as much as this style ... I have some other purses, but I rarely use them ... this one is so lightweight, and I love all the interior pockets ... it's just perfect for me. I'm having a little trouble choosing a new fabric, but I'll bite the bullet and send my order soon. Many thanks for this message I received from one of my regular customers, L.A. after I made her some new bags. Why my newest Raccoon is so Splendiferous by L. A. 1. 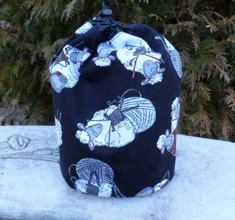 It is like the original Raccoon I groveled to have you make :-), BUT like an upgrade with the pockets. It still holds a ton of dvds because of how deep it is, BUT I have pockets on the sides to help better organize it. 2. I LOVED, and still love, the fabric from my first, but it's so lovely to have such a big change! AND it's like TWO bags as I have the whimsical witch on one side, and conservative and staid bare trees on the other :-). 3. My Sweet Pea exactly matches one side of my new bag. 4. IT'S PERFECTION! IT'S UNIQUE and DURABLE and it will last me forever :-)). 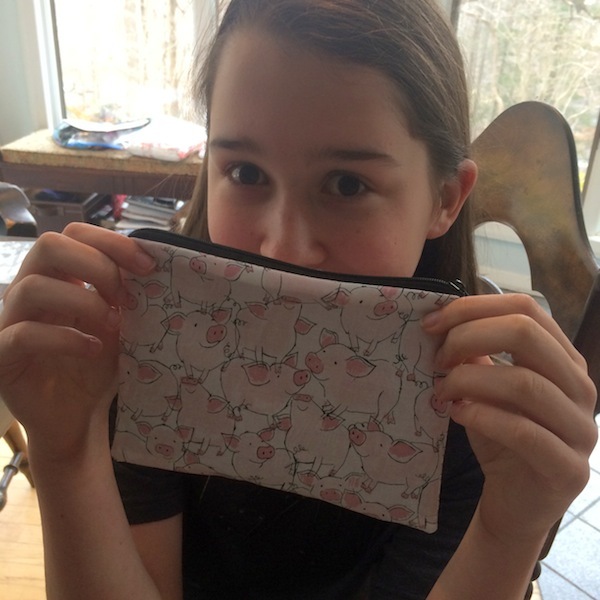 Here's a great photograph of Charlotte with her new Happy Piggies Scooter zip bag. How cute! Thanks so much to Michelle for sending this amazing pic of the bag's owner, Abbie! 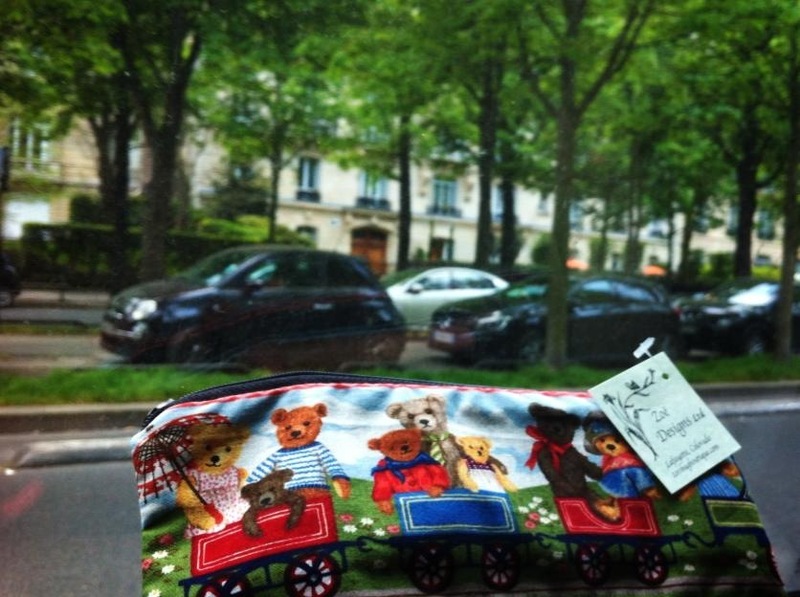 One of my pencil cases in Paris! 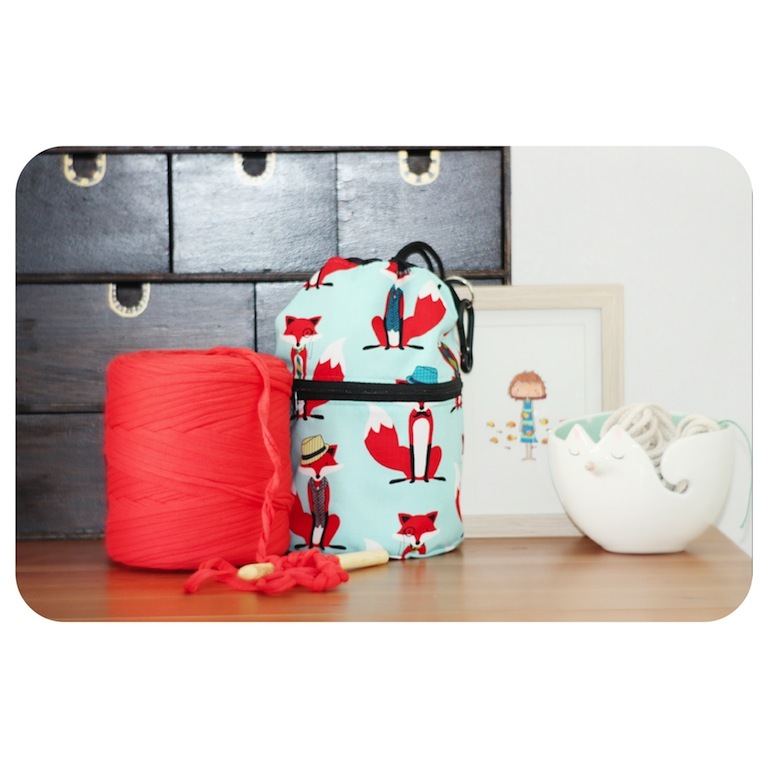 As a sewist & knitter, it's embarrassing to admit that you go out in public with your craft in a crappy plastic bag. This bag is so awesome I don't even know where to start - it's beautifully made, robust, unique, holds my projects safely, allows me to strap it to the safety bar of the seat in front of me on the bus so I don't have to juggle, and the fabric is amazing. Every knitter needs one of these. Thank you!! Perfect, perfect, perfect! Karen has some of the most interesting and fun fabrics I have ever seen. Every single item I have from her is meticulously crafted, and she always gets every detail just right; it is a total joy to work with her on custom orders. I enjoy her work more than I can adequately express! 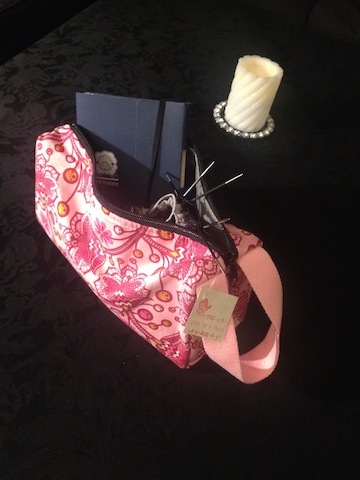 Using her bags for travel and organization make even the most mundane tasks fun and interesting. I am a hard one to impress with most things and I was shocked at how blown away by this product I was. The seller was amazingly quick to get my custom order figured out and it turned out EXACTLY how I wanted it. I got it today and used it a ton already. I've been knitting for years and have spent an (almost) embarrassing amount of money on this hobby and I can honestly say that aside from the yarn itself, this is THE SINGLE best purchase I have ever made with my knitting hobby. Thank you so much. I got my package! Everything is great!! Thank you so much! No matter how beautiful your purses look in pictures, they are always better in "person!" Once again, thank you for a wonderful job, great service, and total commitment to your work. I have always been extremely pleased with your work, and after all these years, I enjoy every chance we get to work "together." But the very best moment is when the purses arrive at my door steps and we get to open the box and hold the beautiful final products!! Thank you for making each order such a great experience! 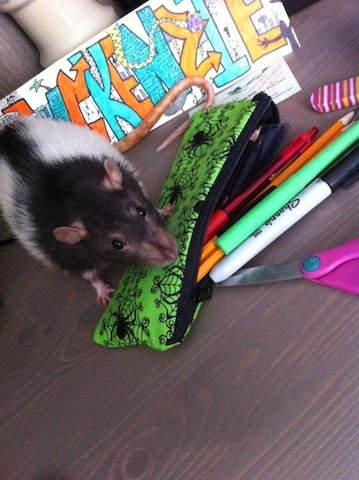 Mackenzie's pencil case with Rose. How adorable!